I normally like graffiti - but I'm not really thrilled by this expression of art. For me it's a combination of the wrong canvas (face brick), the location (which was among the vineyards in Stellenbosch) and I guess the lack of originality that makes me a little ambivalent about the work. How do you feel about artwork, and about graffiti in general? 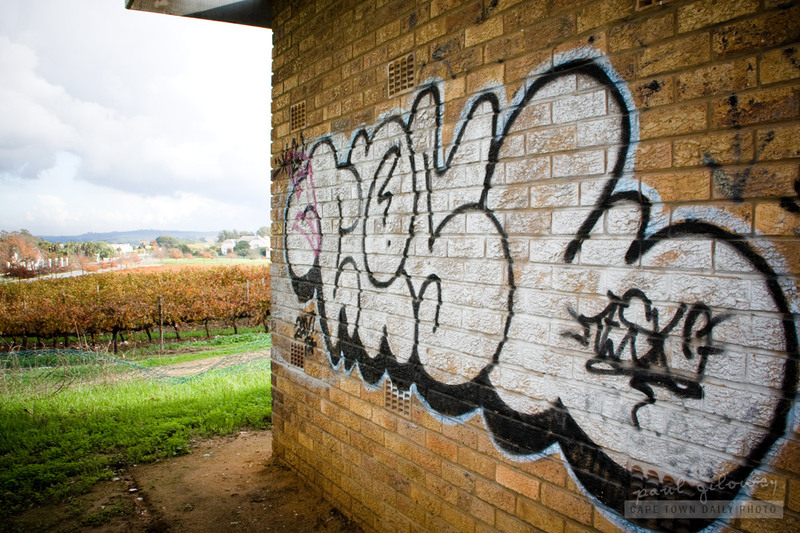 Posted in General and tagged graffiti, vineyard on Wednesday, 22 June, 2011 by Paul. If graffiti could be contained on a particular wall (as public art?) perhaps, but I find it offensive because of the lack of respect for those who own the defaced property who have to, at their own expense, clean up the after the taggers.